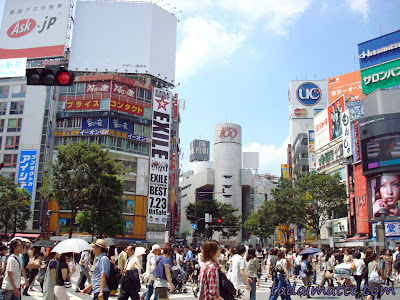 I touched down at Narita Airport in 2007 as part of a wide-eyed crop of new ALTs - Assistant Language Teachers. We were part of a grassroots government-sponsored program called JET (Japan Exchange and Teaching) that is well-known among expatriates in Japan. JET is often said to be the "cushiest" way to teach there - you are well taken care of; you are provided with a go-between and an excellent salary, your airfare and arrival expenses are taken care of, and you are usually set up in your predecessor's apartment. In 2011, there were 472 Canadian JETs total on the program, and the Toronto consulate usually sends out about 100 of them each year. No Japanese knowledge required - in fact, aspiring JETs were often warned not to look too proficient at Japanese in their applications, lest they be scrubbed as suspected "students of Japanese" rather than "teachers of English." Even worse, you might let on a little too much about how you came to be interested in Japan, and have your application thrown right out! I took two and a half years worth of classes during my own university days - it was a presentation in my second-year Japanese class that brought the JET programme to my attention. An ex-JET came in and spoke to the class on teaching in Japan and how great it was. I remember little about the presentation itself - I just remember thinking "it sounds good, but I'm way too shy/incompetent with grammar/not worldly enough to do it." I had never been out of the country before - not even to visit the United States. But by the time I graduated in 2006, I had decided to try teaching in Japan after all, and the JET programme was the first option on my list, with Aeon and Nova (!!) close behind. It was a lengthy application process - I worked at a local bookstore through the six months or so that it took me to finish and send out the application, and attend an interview in Toronto. I was certain I blew the interview when one of the questions was "What's the population of Canada?" and I, having only really prepared myself for questions about Japan, came up embarrassingly short. I returned home ready to file an application with Aeon. Imagine my surprise when I got my acceptance letter a month later! Not only that, but I was placed in the city of my dreams, Osaka, one of the most-sought prefectures in the whole programme. (More on this miracle in another post.) I started packing up my life - I was going to Japan!